But, in case you missed it, Caldara took heat from fellow Republicans too, such as State Sen. Larry Crowder (R-Alamosa), who wrote a letter to The Post in response to Caldara, who heads up the conservative/libertarian Independence Institute. Crowder took issue with Caldara for thanking Republicans who voted against the measure, which reclassified the “hosptital provider fee” as a business under TABOR. Caldara: Let me thank the courageous Republican senators who stood up to leadership and the pressure cooker of the takings coalition and voted no: John Cooke, Chris Holbert, Kent Lambert, Kevin Lundberg, Vicki Marble, Beth Martinez-Humenik, Tim Neville, Ray Scott and Jim Smallwood. Heroes all. Crowder: The lawmakers Jon Caldara thanked for voting against the bill all happen to represent metropolitan areas, where hospitals are big business. But that isn’t true for rural hospitals, many of which are just trying to stay open. Closure of these facilities would mean real hardship for rural Colorado. But Republican state senators who voted against the reclassification of the HPF were doing more than rejecting the painful cries from rural hospitals. They were turning their backs on pretty much the entire business community, with deep ties to Republicans, which stood together in favor of the HPF reclassification. Recall this list of biz groups that backed the HPF reclassification last year. 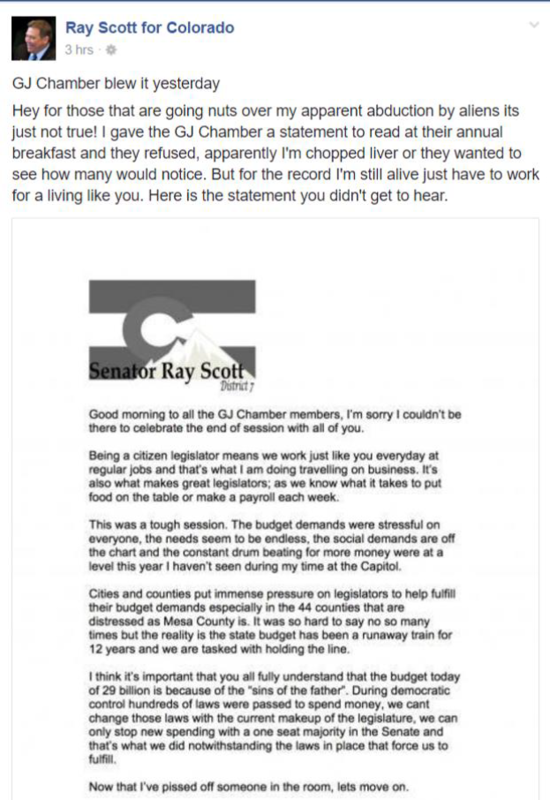 So, it’s no surprise that State Sen. Ray Scott (R-Grand Junction), is apparently a persona non grata at the Grand Junction Chamber of Commerce these days. 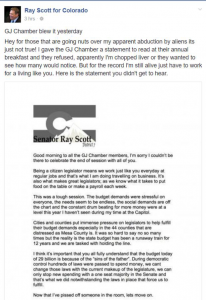 Scott, who was unable to attend the Grand Junction Chamber’s event, went on to blame Democrats for the budget problem, but he didn’t mention that some of his fellow Republicans, like Crowder, inched toward a solution. While Scott’s success was getting thanked by Caldara in The Denver Post. This entry was posted on Wednesday, June 7th, 2017 at 3:02 pm	and is filed under Colorado State Legislature, Grand Junction Sentinel, Media omission, Uncategorized. You can follow any responses to this entry through the RSS 2.0 feed. You can skip to the end and leave a response. Pinging is currently not allowed.